Today we’re going to continue on our survey of low carb and keto noodles. So far I’ve shared recipes that use homemade egg noodles, as well as kelp and shirataki noodles. I’m beginning to feel like a substitute noodle connoisseur. Today, at Costo (of all places) I found a gluten free and high protein organic noodle from Seapoint Farms that is made from edamame beans. Unlike most low carb pasta, you actually use boiling water to soften the noodles up like you would normal noodles. 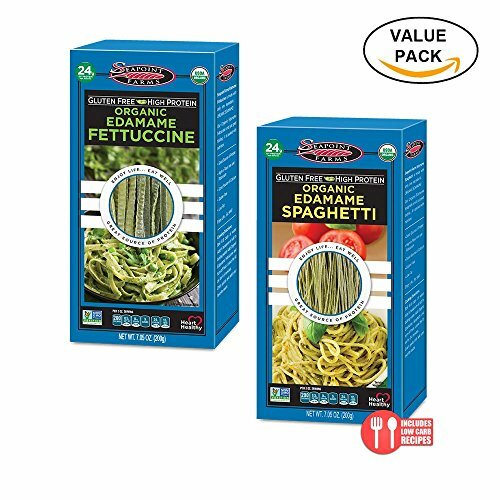 Edamame noodles have the mouthfeel of real pasta and the very subtle taste of edamame beans. The net carb count is much higher than egg, shirataki or kelp noodles though. It’s got 9g net carbs per serving. Because of this, I decided to make a very low carb pesto sauce to go along with the edamame pasta. It’s a traditional pesto in all ways but one: it’s actually made from parsley. I like using parsley for pesto every now and then because it’s got a mellower flavor than basil. (Also… I ran out of basil.) But never mind that, it turned out awesome. I had a delicious plate of low carb spaghetti with just 10g net carbs. So I give a hearty thumbs up to edamame pasta. I used edamame noodles in this pesto pasta dish and it was solid gold. It’s a low carb, keto, vegetarian and vegan recipe that’s got just 10g net carbs per serving. 1. Bring 6-8 cups water to a boil in a large soup pot. Add 1/2 teaspoons salt to boiling water. Add Edamame Spaghetti and turn off the heat. Cover with lid and soak for 3-4 minutes. Drain pasta and dry the noodles a bit with paper towels. 2. Add pine nuts and garlic to a food processor or high powered blender. Process for 10 seconds. Add parsley, salt and pepper and process until a paste forms, about 1-2 minutes. With the food processor still running, slowly pour the olive oil through the feed tube and process until the pesto is thoroughly blended. Add the Parmesan cheese and process 1 minute more. 3. Toss the spaghetti noodles with the pesto until all the noodles are evenly covered in sauce and serve immediately. I really liked the noodles too. Yep, they are my new go-to noodles.